KEEP CALM AND CARRY ON: 6 FAVORITES TO BUY NOW! 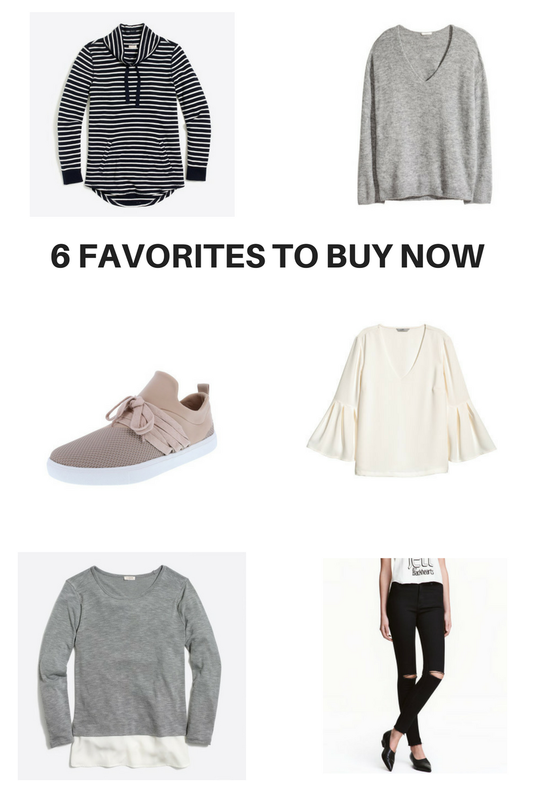 6 FAVORITES TO BUY NOW! Alright you guys...here are some of my favorite recent purchases//finds! H&M has some really great sweaters and jeans right now and you can get free shipping on orders over $40 with the code 0040. Also, you may have saw when I posted about these sneakers before (they look just like the $70 Steve Madden version) but yesterday I randomly popped into Payless and found the exact same ones in this blush color (which I like more than the black!) for only $29 + right now they have BOGO! I got Grayson a cute pair of gray casual sneakers for $10. Not bad at all! They are so comfy! It's almost Friday! Have a great day! The link for the striped sweatshirt isn't working. Can you forward it to me?? ?